I love the outdoors. There is just something grounding about being outside and enjoying nature. We also love summer water play- whether that is swimming, boating, surfing, or now paddle boarding! I had heard a lot about how fun paddle boarding was so when I got the opportunity to review a Body Glove Paddle Board, I was eager to do so. 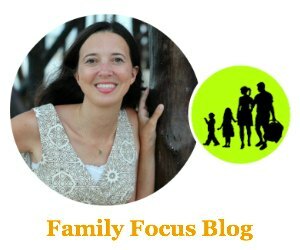 I can tell you that using our inflatable stand up paddle board is now a new family favorite activity and it is such a great way to have active family fun. I was provided with a Body Glove Performer 11 Blue Ocean Edition iSUP in order to facilitate review. Stand Up Paddleboarding has been picking up interest and it is actually now the fastest growing water sport. It involves a surf style board and a long paddle. It gives the user a high vantage point over the surface of the water and an excellent full body work out since it uses a combination of strength, core and endurance. Paddle boarding is all of that while being relaxing as well because you can do it at your own pace. It is sort of like surfing, only way easier to stand up and stay up! 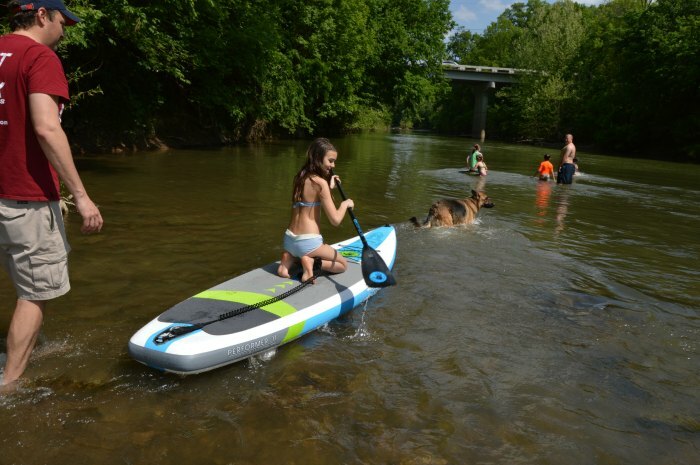 While you can find stand up paddle boards that have a fiberglass body, the inflatable stand up paddle board is an innovative solution that makes paddle boarding so much more convenient. The inflatable stand up paddle board is made of a thick rubber that easily rolls up when deflated and that feels rigid and hard when inflated. This means your inflatable stand up paddle board can fit into a take along back pack and serve you at the lake, flat water river, or the ocean. I received the Performer 11 Blue Ocean Edition iSUP (Stand Up Paddleboard) for my inflatable sup review. It arrives in the mail in a large box that has everything you need to use your new inflatable paddle board- adjustable aluminum 3pc standup paddle, high pressure hand pump with gauge, dry pouch, coil leash, and backpack carry case to fit it all. We headed out to a river access point at Harpeth River State Park Hidden Lake. While a stand up paddle board is great for exploring lakes, that particular lake is really too murky for that type of activity but the river access there is perfect. 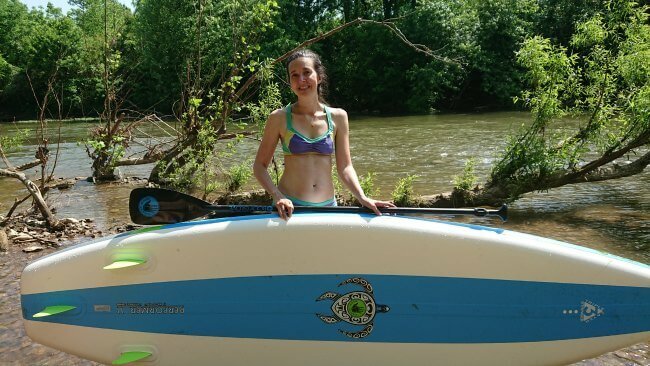 Paddle boards aren’t meant for white water rivers (you don’t want to fall off and hit your head or body on rocks) but this area of the Harpeth River has a nice calm flat water section that extends back up stream under the bridge for quite a ways. I put the Body Glove back pack on and transported the inflatable paddle board down to the river with ease. The back pack is rather large but it is also lightweight at 24 pounds. I pulled everything out and unrolled the board. The board fins were protected with “air wings”. Then we just hooked up the pump and inflated it using the gauge to know when to stop. I attached the coil leash (to keep to the board from getting away from you) to the board at the labeled point. There is also a point where you can attach the provided dry pouch Body Glove cell phone case and another point where you can attach a go pro camera. The lightweight but strong aluminum paddle comes in three pieces and snaps together quickly. The kids were eager to try out the inflatable paddle board first and I thought they could use some vigorous physical activity so I let them have at it. My daughter went first. She kneeled on it in the shallow and we pushed her out into the deeper area and then she stood up and paddled. She loved it and when she came back to us, I told her to hop off and give her brother a turn but she said she didn’t want to get off yet! So they got on it together and went off and came back. Then I tried it with the kiddos! Then they tried it by themselves again. They really couldn’t get enough of it! Our inflatable stand up paddle board got plenty of use that day and the whole way home my daughter was talking about when we would go do it again. Besides being fun physical activity it was fun to get to look at nature from a different perspective. We liked going along the edge of the banks and spotting turtles, fish in the water, and herons. We went back again the following week with one of my daughter’s friends. 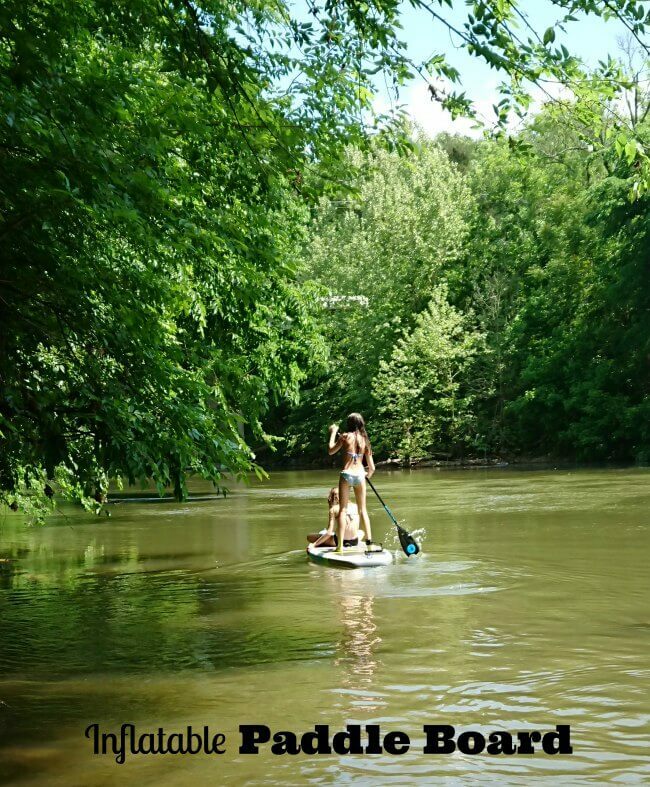 Paddle boarding is becoming our new go to adventure. My little girl loves to explore and so do I. 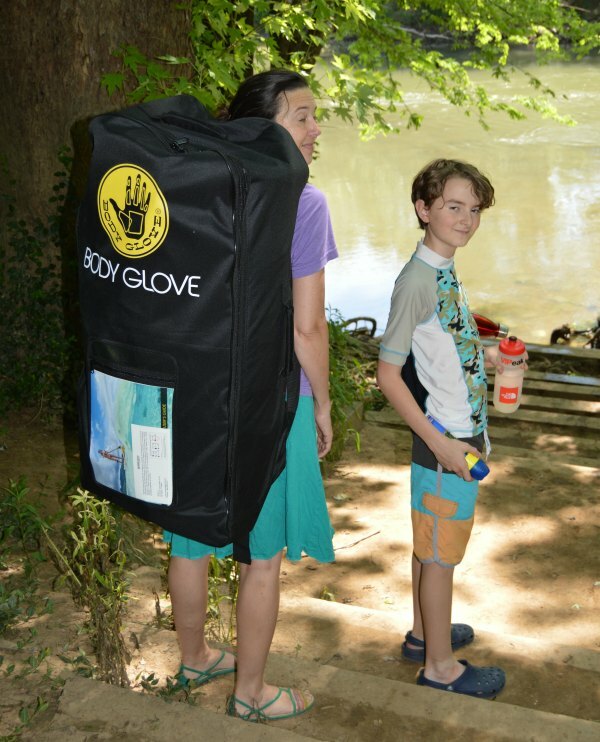 The Body Glove paddle board is so convenient and easy to transport. It sets up very quickly and is easy to use. It is lightweight for carrying and it has great grips so it is easy to sit, kneel, and stand on. Additionally, it is super easy to deflate and pack away. I love having this new adventure gear and I can’t wait to explore more places with it! Have you tried a stand up paddle board before? Have you tried an inflatable paddle board? 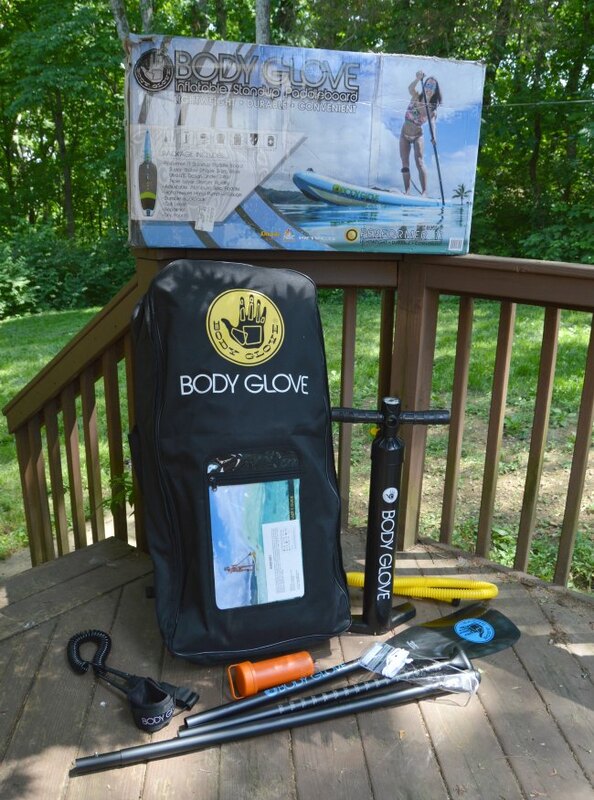 Do you think you would like to give this Body Glove inflatable stand up paddle board a try? What body of water do you have in mind to explore? It’s a great board, one I’ve used in a few lakes around the country, since it’s easy to transport. What a fun idea! A great way to try out a new sport to make sure you enjoy it too. I like how incredibly portable it is as well. Looks like a fun time! My kids love being on the water and have pretty much mastered boogie boarding. I think a paddle board would be fun and make for a wonderful next step.